"There are certain subjects which are prevented or we simply proscribe from discussing within the lodge, " Piers Vaughan, master of St. John's Lodge #1 in New York, told Mo Rocca. "And religion is one. Politics is another." "Do they discuss forms of politics and events that have happened? Yes, they do, " said UCLA history professor Margaret Jacob. "Do they say, 'Well, I'm a Democrat and therefore I think ...' Or, 'I'm a Republican ... ' No, I don't think they do that." "Freemasonry has the look of a religion, " said Jacob. "You think of religion as ritual, there's also this ritual element. But there are no priests, there are no ministers, there are no rabbis, there's no system of clergy of any sort. Everybody's their own thinker." In 1738 the Catholic Church condemned Freemasonry, and has since issued about 20 decrees - directly or indirectly - against the fraternity. In 1983 Cardinal Joseph Ratzinger (the future Pope Benedict XVI) re-affirmed this position. "This is an organization of believers, " he said. "When it was started on a formal basis in 1717, many historians believe that it was trying to bridge the gap between the religious civil wars that had been going on in England at the time. The Catholics would get in power and beat up on the Protestants; the Protestants would get in power and beat up on the Catholics; and everyone was beating up on the Jews. "So when the Freemasons were formed, [they] said, 'Here's a group of men that agree that God is central in their lives, they can even agree that God compels them to do good in the community, then they can shut up after that." That was a radical concept - that men could get together and agree on that fundamental level, and then get on with their lives." Two of America's earliest presidents, George Washington and James Monroe, were Freemasons, as were Benjamin Franklin, John Hancock and Paul Revere. But many leading figures in the American Revolution - including John and Samuel Adams, Thomas Jefferson, James Madison and Thomas Paine - were not Masons. The back of the dollar bill features an incomplete pyramid with an eye on top of it. Many people - including some Freemasons - say it's a Masonic symbol, but that's not the case. UCLA's Margaret Jacob says these symbols have been used by many different groups, including Masons, throughout history. 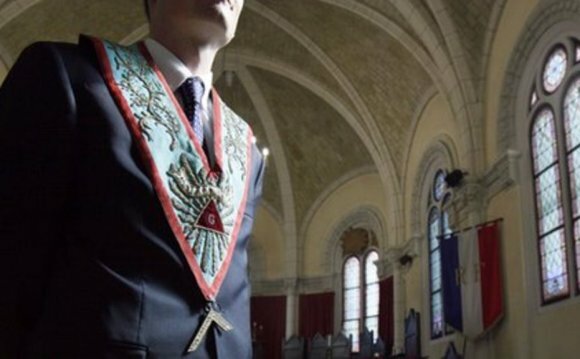 "I'm sure there are a lot of Freemasons who want to believe [they're Masonic symbols] and who will tell it to you, because it makes the Lodges seem important, " Jacob said. "I mean, if you have a symbol on the dollar bill, that's a big deal!" Brent Morris said there are two types of people who want to promote the idea that the symbols are Masonic: "The pro-Masons and the anti-Masons - and that pretty well covers the universe. "The Eye of God is a common icon for God looking over the affairs of man, " Morris said. "It's an icon that appears in cultures across the centuries. The uncompleted pyramid [which also appeared on a 50-pound Colonial note] represented that our country was not yet completed, that we were continuing to grow."